Our convenient, moisturizing, Timeless Natural Hand Cleaner is ideal for all skin types and easy to use anywhere. Organic Lemon, Rosemary and Lavender extracts have natural astringent qualities to thouroughly clean hands. Organic Aloe Vera, Olive Oil and gluten-free Wheat Germ Oil extract help hydrate, nourish and condition the skin. The travel-sized tube makes it suitable for flying and storing in a purse, desk drawer, diaper bag or child’s backpack. Hand cleaners sting and usually contain undesirable ingredients like triclosan and alcohol. Non-alcoholic, triclosan-free, organic Timeless Natural Hand Cleaner is non-irritating and non-toxic. It cleanses hands without water and leaves them feeling moisturized and smooth. Unlike alcohol-based cleansers, you only need a couple of drops. Shake well, then dispense and massage into your hands for no more than 30 to 40 seconds. If it takes longer, you have used too much! Your hands will feel silky smooth. Keep a bottle on hand in your purse or diaper bag. 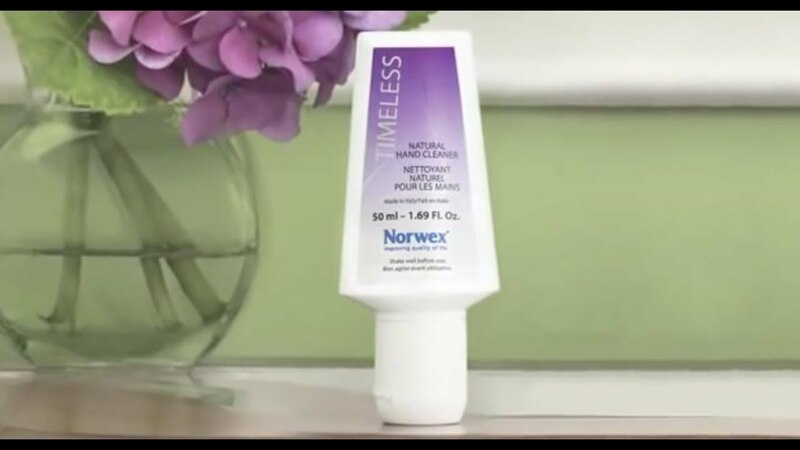 Norwex Timeless Natural Hand Cleaner has been certified by two reputable agencies, EcoGruppo and NaTrue. EcoGruppo, an Italian certification body, ensures the product has been formulated with very pure raw materials, particularly from organic farming. EcoGruppo guarantees the absence of GMO and ionizing radiation, as well as pesticides and synthetic substances. EcoGruppo ensures that all ingredients and manufacturing processes reflect its organic certification requirements. Try to avoid touching your face with your hands. Here’s why: According to WebMD.com, about 80% of infectious diseases are transmitted by touch. When you unknowingly touch your face, the germs can enter through your eyes, nose and mouth. And those germs can also be transmitted to others through shaking hands (direct transmission) or handling items that others then touch (indirect transmission).